The New York City Housing Authority provides housing to low- and moderate-income residents throughout the five boroughs. In 2013, public housing was home to 4.8 percent of the city’s residents, but the nearly 95,000 students who lived in public housing made up 8.6 percent of the public school population, including charter school students. 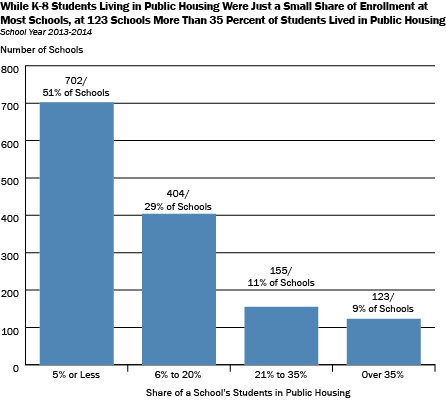 IBO calculated the share of elementary and middle school students in each school who lived in public housing in order to gauge how the students were distributed across schools during the 2013-2014 school year. We chose to look at grades K-8 because high schools tend to be less tied to specific geographic zones. In 123 schools serving grades kindergarten through 8, students in public housing comprised more than 35 percent of enrollment. This 9 percent of schools accounted for more than one-third of all K-8 students living in public housing. Conversely, most schools served few students living in public housing: In 702 schools, 5 percent or fewer of their K-8 students lived in public housing. The average K-8 student attended a school where 8 percent of students lived in public housing.